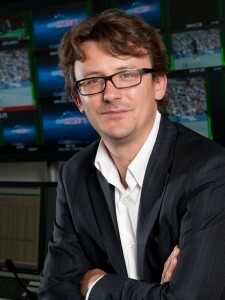 Alexander Daquo has worked for Eurosport since 1991. He joined as the first reporter on athletics and football and covered every World Championships and Olympic Games during the 1990’s. He also had the opportunity to make documentaries about the best athletes of that era and produced programmes on Olympic gold medalist and world record holder Maurice Greene, Ethiopian distance running legend Haile Gebrselassie and Moroccan athletics star Hicham El Guerrouj on their Olympic quest. From there Alexander became Eurosport’s Head of the Tennis then moved to the company’s Olympics department in 2000. In 2006 he became Editorial director of Eurosport . In 2008 Alexander received the “Deutsche Fernsehpreis” in the best sports events category for Eurosport’s coverage of the Beijing Olympic Games.